Every mirror, it seems, is inhabited by a tiny sprite who operates the mirror. Without the mirror sprite, there's no image to behold, only vacant glass. Each mirror is a little different from all the others. Some make you look thinner and some heavier. Some show objects with a reddish caste, others show more blue, and still others favor shadows. It's all at the behest of the mirror sprite who resides within. I got me a second-hand mirror at an antiques store in Philadelphia. 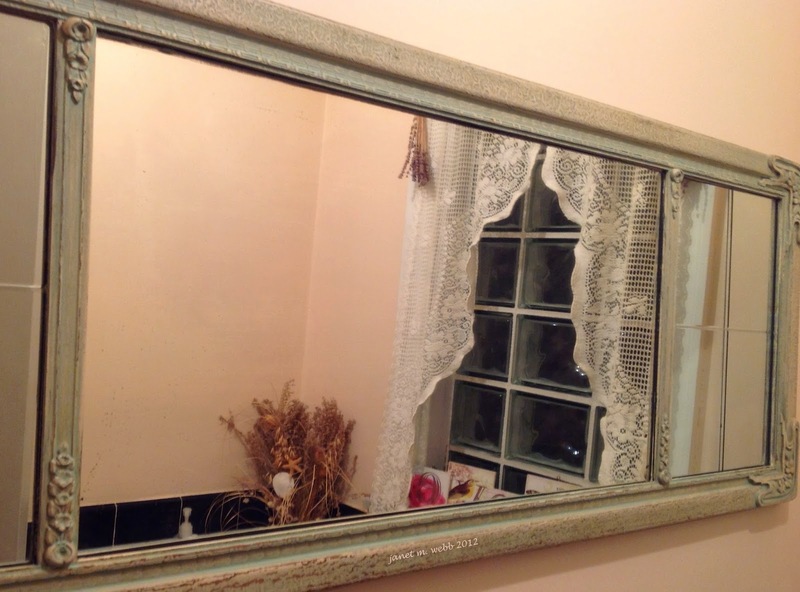 It reflected the image of my bathroom, all pinks and flowers and lace and happiness. I live over a garage in the seediest part of town. I thanked the mirror sprite for my new room, though I've never seen him, and never will. Went a little serious for some reason this week in my Friday Fictioneers entry, probably because my humor writing has been about as funny of late as a colonoscopy performed by a deranged proctologist. Hope I haven't freaked anybody out with this. You can go to the mirror, boy, to see what the other Fictioneers have done with the prompt by clicking right here. Meanwhile I'm still looking for that mirror sprite. Frankly I really don't like pink all that much! Not a bad idea to go serious. Let it out! Fine work, too, Perry! I really liked this Perry, not just the way you've presented it, but the concept of a mirror sprite is something I found really alluring. Well done. Wow, Perry, I thought that was funny. I didn't know that mirrors had sprights in them. I didn't laugh at the deranged proctologist line, though. Although I do tell my proctologist that he's getting too close for comfort. Feel better. be silly. Have some fun. It's nice to see this side of you. It suits you well. Can I get a mirror sprite who will paint out my wrinkles and spare tyre? Thank you. It's about time I was recognized as the serious artiste I am. Also I'm hoping it will get me chicks. Well, that explains some odd things I've been seeing in my mirror lately--or the past 10 or 15 years actually. Serious is good sometimes--though I am concerned about the whereabouts of that deranged proctologist. Thanks, Oliana, but damn! I had a hidden agenda to freak you out. I have failed! But they are real, Sandra. Just ask your nearest mirror. Glad you liked,Randy. My deranged proctologist was so pleased he's coming over to see you. Doesn't matter when you bend over or not. He's already too close for comfort! Both of my sides thank you, though this one a bit more morosely. Same thing here, Susan. I'm sure my sprite hates me because he makes me look like a 64 year old instead of the 35 year old I am. I may sue him, or at least get another mirror. They're very hard to find and very expensive. And they have to possess no professional ethics whatsoever. Let you know if I find one. Where can I get me one of those sprites who makes me look thinner AND younger? I'd even settle for looking middle aged if he could take 30 lbs. off. Wow Perry. You amaze me. Now I have to get in and out of the shower fully clothed! Thanks a lot! There's a nice sweetness and poignancy to this piece. Almost poetic and gently humorous. I have that very sprite working for me, Russell. He had a heart attack recently and is looking for an easier job. Sorry, I don't think you qualify. The mirror sprite made me do it! I always do that anyway! An interesting take, Perry. And everyone deserves a chance to live in a "different" world once in a while. I love the idea of mirror sprites, partly because the word itself is so fun. Wondered about the "all pink....." line then read you weren't so very fond of pink phew! Very fun story. Very cool, Perry. Love it. It's all about perspective, right? Happy Birthday, Perry! I hope it's fab and everything you want it to be. Best wishes!! I think this is a great story so I need to be on the lookout for a mirror sprite. Cool idea and I love the concept! Brilliant! Very interesting take on this week Perry. I like your serious side! I think I did get one with a malevolent sprite. Mine shows me images of someone who's, believe it or not, 64! Thanks, Rochelle, I thought that too. Look for great art from me from now on! Thanks, Sandra. Even if the other world is only in a mirror. That's right, Alecia, I usually only wear pink two or three times a week. Actually I guess the color is more like peach, but I saw pink. They got scads of 'em at Bed, Bath, and Beyond. I think it's all about paying off the mirror sprite if you can figure out how to do it. Well, I wouldn't say it's a great story, but it's certainly a very, very good story. Well, maybe it's kind of great, but not fully ... oh, it's fabulous, I admit it!!! Thanks, Bjorn. Next week I'm going to include a discussion of monetary policy. Thanks, Dawn. I'm going to keep my serious side up and hide my side that get's blue. Wait, that can't be right!